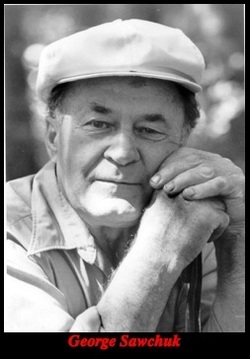 George Sawchuk was born in 1927 or 1929 in Kenora, Ontario, one of three sons of a Polish mother and Russian father. Although he rejected formal education at the age of thirteen to begin a thirty-eight year career as an itinerant laborer, his early education left an indelible mark throughout his training at the traditional Roman Catholic school, be also attended, for two hours daily and on Saturday day mornings, lessons in the Russian language and "World Politics" sponsored by the local Bolshevik or Labour Hall. These polarized ideologies remained the dominant touchstones in his intellectual development as Sawchuk pursued a self-educated course to determine a philosophy of personal and social integrity. More than imbuing Sawchuk with a complex ethical and political consciousness, the unlikely amalgam of opposing systems gave him a propensity toward a consistent belief structure. The two extremist positions formed a dialectic which has been the basis of his thoughts and behaviour ever since. His conscious quest for a congruous approach was fortified by his self-disciplinarian habits, born from the necessity to survive and a stubborn nature. Sawchuk conscientiously studied Marx in a remote logging camp, and his curiosity once kept him on board a ship for months to continue a dialogue with a retired University of Toronto history professor. This existential existence was constantly tempered by the hard realities of a working-class life and by his daily encounters with nature. He also developed a series of manual skills and honed his social ideas within a tradition of trade unionism.